And now on to the interviews. Thanks for reading. Sam O’Keefe (C3-Athletes Serving Athletes, 1st Place, Men’s 3/4): I was preparing for it to be actively raining so race prep actually went better than I was expecting it to! I remembered bits of the course from last year so I kept my bike clean and skipped a pre-ride. Kristopher Auer (C3-Athletes Serving Athletes, 2nd Place, Men’s Masters Elite): I did not pre-ride the whole course but did roll through the early part through the lily ponds. Jay Morali (C3-Athletes Serving Athletes, 2nd Place Masters 3/4):I attempted to ride the course but shortly after the prologue section I ripped two spokes off my rear wheel so I had to carry my bike all the way back to the car. I did not bring a back-up set of wheels but had multiple people offer me a spare. A huge thanks to Todd Bickling of Bike Doctor for letting me muddy up his extra wheel! Tyler Karnes (Pioneer-SM 3rd Place Cat 3/4): Definitely before the race I did a few more laps than usual, due to the excessive amount of mud. I rode the course about 5-6 times before the race. 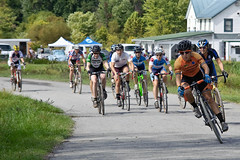 Travis Coleman (Route1Velo/Arrow Bicycle, 2nd Place Men’s Cat 4): [ed. note: Travis was riding under the old Black and Blue of Jay Moglia’s Raw Talent Ranch Kit. 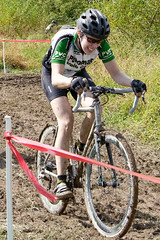 (Sponsor of R1V/ Arrow Bicycle) He noted that he was “too cheap to throw down for the R1V grey matter cyclocross kit.”] This was my second cx race and first in mud, so I altered little. I did pre-ride the course. I wouldn’t think of pulling up to the start line without pre-riding the course. Chip Hoover (Latitude/ABRT Elite (2009), Haymarket/HomeVisit Elite team (2010), 1st Place Men’s Masters 3/4): Nothing different than the usual 45 min warm-up. Did you pre-ride the course? Absolutely- Always- That helped a bunch with tire pressure and knowing the good spots for passing and attacking. Loretta Torres (Bike Line, 1st Place Women’s Cat 4): It was my first cross race ever and I loved it! I did 2 laps before the race. Bayer testing out the 'cross bike. Lindsay Bayer (Potomac Velo Club/Seven Cycles, 3rd Place Women’s Elite, 1st Place Women’s Cat 3):This was my first race of the cross season and my first time using my cross bike, so all of my preparation was trial and error this time around. I did one lap of the course just to see what I could/couldn’t ride on the bike (as opposed to the mountain bike I used for cross last year) and to make sure I properly clogged up my drivetrain and brakes with mud before my race. Becky Frederick (Kelly Benefit Strategies/LSV, 2nd Place Women’s Cat 4): I was there from about 8 am for my husband’s race, so I pre-rode several times then changed my kit and shoes and cleaned my bike up before our start. I also always watch a few spots during the elite masters’ race before ours to know how the course has changed and where the faster lines are. Jay Morali: I did a little of both. I tried to pick the right line to ride it but was ready to get off and run when that did not work. I felt that I was going about the same speed doing either. Tyler Karnes: I tried to keep as much speed as possible going into the muddy sections. I rode until I started to get bogged down, then I would run until it cleared up. After seeing an artemis guy climbing out of one of the ponds on the first lap, I decided running might be a better option. Travis Coleman: Ride, Ride, Ride. Put it in a small gear and press the legs down. Kristopher Auer: I rode as far in as possible, but was prepared to dismount before i even hit the section. I ended up running the majority of each muddy section but there were a few secret lines left to take during the masters race. Chip Hoover: Rode all but the last lap. Loretta Torres: I mostly rode all of the mud sections thanks to my mountain bike. ( Gary fisher superfly 29 carbon). Lindsay Bayer: For the first two laps, I ran some of the muddy sections because it was too slow and sloppy when I tried riding them. 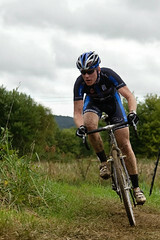 Later in the race, it got easier to stay on the bike and slog through the mud. The short, muddy hill at the back of the course was a run-up for me on each lap. No way was I getting the bike up that thing. Hell, I fell just running it on the third lap. Becky Frederick: I did some running and some riding. The long section I rode every time. By the end of our race I was riding the second mud pit, albeit slowly. Tyler Karnes: Definitely starting quite a few rows back was a big part. I dropped the ball on registration. The run-up section was a big part of the course. Jay Morali: The decisive moment of the race was the early selection made with Chip Hoover and Keith Rohr. For me, being at the front was the key. I was able to pick the right lines and not fight so many other riders. We were talking and made the decision to work together to put in a good gap on the field. Once we established that it came down to a three man race and finally Chip put in a hard effort that we could not answer. Travis Coleman: Second lap I was on the front and I looked back over my shoulder. Front wheel washed, foot down sliding in the muck, 2nd and 3rd passed. I steadied myself and locked in on 2nd places wheel. 1st place was going up the road. 2nd place was the best I could finish. Kristopher Auer: The day was lost the moment Blair bridged to me on the road flats. That guy can motor on the straights and he rode me and Cam right off his wheel. I think or at least was told I kept the gap in check without significant loss or gain until the final section on the last lap. It was over and I just rolled in to the finish. Chip Hoover: I’m a roadie, so I hammered the gravel road and the open sections and powered up all the climbs pretty hard. I had 2 others with me leading 1/2 way thru the second to last lap. On the gravel road I attacked pretty hard. They bridged back up to me prior to the back section. I then attacked again and that was it. Loretta Torres: I had no idea how I was doing I just kept pushing as hard as I could and never looked back. Lindsay Bayer: That would be the finish line. Elizabeth Harlow and I were battling it out for the second half of the last lap, and I passed her on the last climb at the back of the course. She stayed close behind me and as we came into the home stretch and started sprinting it out, she was just a little bit faster. She pulled ahead and beat me by a tenth of a second. Of course, that means I’ve spent every second since thinking WHAT IF and WHY DIDN’T I JUST, but that’s racing and when it came to crunch time, she pulled off a better sprint. Becky Frederick: I had a great start and settled into my own pace and 2nd wheel pretty quickly. I was sorta surprised to be running that close to the lead – this wound up being my best cross finish so far. I held off Loretta on her 29er mountain bike for a while, partly by blocking with my bike while running the mud section that she was able to ride with fatter tires. I had trouble on a remount coming out of that section once and she went by. We wound up catching the woman who had been leading, but I never got past Loretta again. Becky Frederick: I’ve got a new set of clinchers for race wheels – Shimano RS80s that I’m running with Tufo tubular clincher tires. Tend to run around 28psi. I had access to a pit bike Sunday but thankfully didn’t need it. Jay Morali: As I mentioned earlier, I broke two spokes during warm-up so I had to borrow a rear wheel so I had my Easton Tubular on the front (40 psi) and a clincher on the back. Tyler Karnes: Mavic Ksyrium SL’s, Challenge Fangos. 29psi front, 32 rear. I would have definitely changed bikes every lap if I had a bike in the pits. (Anybody out there reading this, Tyler needs a pit bike). Travis Coleman: I’m running an old set of Easton Tempest II wheels with Vredestein Premiato clincher tires. They are a narrow 34c and fairly versatile. 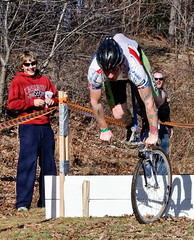 I ran the psi up a couple of pounds, 42 f 45 r. I don’t have a lot of cross equipment, so I was racing what I started with. Kristopher Auer: Bontrager Race X-Lite aluminum tubulars with Fangos, also Bonrtager Race X-lite Carbons with Griffo’s. i ran em at 30 PSI front and rear and did make one exchange after feeling a little sluggishness in my shifting. Chip Hoover: I use Mavic Ksyrium SSC’s and Cosmic clinchers and run Ritchey Speedmax tires. Lindsay Bayer: I use Mavic Cosmic Carbone SLs and Michelin Mud tires. I had a pinch flat several days before the race that I fixed with two patches (and some duct tape, once the patches started to leak air). I kept meaning to get a new tube before Sunday, but didn’t actually get around to it until the last minute, when I realized that finding the right size tube with a long valve stem was very difficult. Long story short, I ran that same patched tube in the race, but put in about 45psi to counteract the tube’s consistent slow leak. It worked and I made it through the race using The Little Tube That Could. Kristopher Auer: I run a 44/38 chainring set up with a 12-25 or 12-27. I rarely use the 38 but the little kickers at Sanders made me glad I had the 38. The sticky mud was dragging and the 38 saved the legs a bit. Jay Morali: I have a 46/36 Crank and a 12/27 cassette. Tyler Karnes: I run a single ring 42tooth up front with double chain guard, with a 12-27 cassette. Travis Coleman: Standard cx rings 46/38 with an 11×26. Chip Hoover: The usual compact cross front and a 12-27 in the back. Lindsay Bayer: The bike is geared and I have a SRAM Red compact crankset, but beyond that I don’t know. That sounds lame, but I knew nothing about building a cross bike, so I told the nice guys at Seven to put on the parts they thought I’d like based on my mountain bike specs. I like whatever it is I’m riding, so three cheers for Seven! Becky Frederick: Right now I’m running a 36-46 double with a 12-25 cassette. Might switch it up a bit to a 36-42 or so, but otherwise things are working well right now for me. Loretta Torres: I just ride as often as I can 3-4 times a week, and mix it up Mountain, Road and long canal rides on my mt bike. Jay Morali: It took me a couple of days to recover after Charm City. I was truly trashed! I usually take off on Monday and ride easy on Tuesday. I like to get a couple of hard rides in during the week with a rest day on Friday. Small efforts on Saturday to be ready for Sunday. Tyler Karnes: My recovery consists of eating a lot, and doing sleeping intervals. That’s where I gain ground on my competition. Travis Coleman: I simply ride when I can. I have a park near my house that makes for a great cx practice spot. Get a couple of sessions in a week, mix a few intervals in, practice mounts and dismounts and keep it short but fairly intense. Have to ride the day before and after a race. Sam O’Keefe: Whatever Kris [Auer] tells me to do! Kristopher Auer: Training time is varies to the extremes. 2 to 8 hours per week. depends on work, health and other time constraints. The women's field at the start. Chip Hoover: My season is coming to an end. I’m doing base training now and just riding 2 days during the week and on the weekends. I do lots of 20 min and 60 min SST interval work. I plan to do 2 more races then take a break before building back up for 2010. Lindsay Bayer: I race on Sundays, do a recovery ride on Monday, do something to practice my cross skills on Tuesday (running, drills, drinking beer), intervals on Wednesday and Thursday, a recovery ride on Friday, and an endurance ride on Saturday. This changes a little from week to week based on what my coach tells me, but that’s at least the gist of the training plan. I probably ride for 5-7 hours during the week, and if I need a full day off, I skip a recovery ride. Becky Frederick: I don’t train enough. The most consistent part of my training is practice on Wednesday night with technical work and intervals. Lindsay Bayer: I ride a Seven Tsunami with the SRAM Red Gruppo, an Alpha Q CS20 Cross fork, TRP Carbon brakes, various Seven parts, Mavic Cosmic Carbone SL wheels, Michelin Mud tires, Crank Brothers Eggbeater pedals, and a Selle Italia Flite XC saddle. This is a new set-up from last season, when I rode my mountain bike for every race. I’m still getting used to the drop handlebars, the fidgety feel of steering a cross bike, and SRAM’s double-tap shifting. Jay Morali: I did upgrade to the new Blue Norcross this year. Ultegra shifters and DA rear der. Tyler Karnes: Currently riding a Specialized Tricross pro. I won the frame set at the Trashmore race in Virginia Beach. I built it up with single ring and dura ace/ultegra, trp brakes, ksyrium sl’s. Travis Coleman: A SOMA steel frame with a carbon fork and old SRAM Force parts. Kristopher Auer: Blue NORCROSS framesets. New model same company as last year and the changes are huge and of great benefit. The 1.5 inch headtube cuts brake chatter to almost 0. The full carbon frame with slightly taller headtube allowed me to go down a size and save a bit more weight and are extremely comfortable. Otherwise Bontrager bars, stem, seat and post as well as wheels. Sram Red and Rival does the job for the pieces parts. Chip Hoover: Bianchi Axis with a mix of Shimano Ultegra and Shimano XT. Becky Frederick: I’m on an older Bianchi Axis with cheap and old components – an old mtn front derailleur, a sticky 105 rear derailleur, etc. New from last year are the compact cranks and wheels and a comfy white Bontrager saddle… which may never be white again. Jay Morali: I’m sticking with the oatmeal, raisins, cinnamon, peanut butter, milk concoction! Tyler Karnes: Whatever I can find in the hotel/house were staying at. Travis Coleman: Breakfast on race day? When you race at 9am, I don’t think breakfast stands a chance. If coffee counts, that’s my breakfast. I need a little something to get the system going. Kristopher Auer: Changed it up. large coffee a nice bowl of muesli and i must admit A chocolate frosted donut. down from 3 donuts last year. Chip Hoover: Race was early enough and I wanted to sleep in so i just had a large coffee and a Hammer gel prior to race. Loretta Torres: Coffee, waffles, fruit and coffee. Lindsay Bayer: Two eggs fried in olive oil on a slice of whole wheat toast, an iced chocolate soy milk latte, a Greek yogurt, a banana, and a glass of water. It’s the same thing I have every day and the only reason I get out of bed. I also had a Clif bar about two hours before the race. Becky Frederick: Half a bagel and chocolate milk before leaving the house. Cottage cheese with ginger preserves and grapes 3 hours before racing. Chip Hoover: My wife, Jamie and 9 month old daughter, Addie made it out to the race. It makes racing much more enjoyable with family support! They Rock!!! Becky Frederick: Shouting back to the peeps who were out there hollering and ringing cowbells Sunday – LSV teammates, my mom, skiing buddies and the like. Thanks to Tracy Lea for some pretty stellar encouragement when I was bonking in the mud on the last lap. And Shea, for being in the pits during my race and therefore missing out on a round of beer. Between all of ya, I made it up the hill by the announcers booth every lap. Jay Morali: Todd Bickling (thanks for the wheel), Chris Zangmeister (thanks for offering a wheel), Steve Riskus (helping me get the new wheel dialed in). Tyler Karnes: Big thanks to Travis McMaster for getting the Pioneer-SM team together this year. Great group of guys and girls and I’m stoked to be a part of it. Also, thanks to Kevin Horvath for keeping me in check throughout the season and keeping the ‘goonz’ in line. Travis Coleman: Shout outs go to my wife for not getting upset when I wake her early on a Sunday morning! Kristopher Auer: Giant shout out to new sponsor swiftwick socks, try em, incredible. Also Athletes serving Athletes, we need more organizations like this, we get a chance to compete week after week. It’s nice to compete with someone differently abled and allow them to experience as much of the thrill as possible. Finally C3 … Thanks for the dedication at CHARM CITY CROSS this year. It doesn’t happen without all of us! Loretta Torres: I want to give a shout out to Joe Jefferson for all the fun he adds to the race. And to Rob and Eric for putting together such a good time! Lindsay Bayer: I want to thank my wonderful fiancé Bobby for cheering himself hoarse during my race, Jim Carlson for showing me how to properly ride my cross bike (unfortunately I didn’t give him this chance until after the race), Mark Stahl for being my training buddy and cheerleader, The Bike Lane guys for keeping my bike running so well, Potomac Velo Club for being such a great group of people, and everyone who worked hard to make Ed Sander an awesome event.